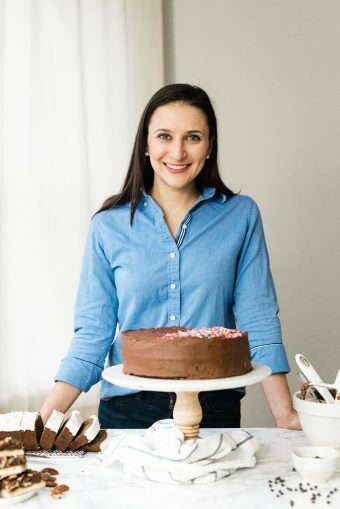 These bars were an accident, in the same way that penicillin was, but minus the infection-killing properties – a happy accident and a recipe that I plan to make again and again. Over the post-Thanksgiving weekend, I had some left over pie crust dough from my obsessive testing and tweaking of this recipe, and at the same time was fighting with Bryan over the last of his mom’s absolutely addictive cranberry sauce that tastes like candy. I was reluctant to make more of the cranberry sauce because a) it never comes out quite like hers and b) there are 2 cups of sugar in her recipe so that’s why it tastes like candy. Because it literally is. Every time I took a bite I thought “ZOMG THIS IS SO GOOD WHO CARES IF I AM PUTTING DESSERT ON MY TURKEY” but after the leftovers were gone, I figured the way to justify making more was to actually put it in a dessert. The cranberry filling in these bars is inspired by the famously addictive cranberry sauce, especially the complementary orange flavor, but with no refined sugar (instead, the filling is naturally sweetened with honey) and sandwiched between a shortbread-y crust and a buttery streusel. I can’t make a bar cookie without a streusel apparently. I’m assuming you’re ok with that? Can I just cut to the chase and tell you that these things are exceptional? I know I always say this but you really, really can’t tell these are free of gluten, grains and refined sugar. You will not miss them. I can’t wait to share these with family and friends this holiday season, and I hope you’ll do the same! Preheat the oven to 350 and grease an 8"x8" baking dish. Prepare the pie crust dough and press into the baking dish in a single layer. While the crust is cooking, make the filling by cooking the cranberries, water, honey and cinnamon over medium heat until it starts to bubble. Add the juice of the clementine, then discard the remaining inner flesh. Thinly slice the peel and add it to the pot with the cranberries. Cook for 15 minutes until the mixture is thickened, stirring periodically to make sure nothing is sticking to the pot or burning. While the cranberries are cooking, make the streusel topping: In a medium mixing bowl, whisk together the sweetener/sugar, cinnamon, almond flour and salt until evenly combined and no clumps remain. Use a pastry blender or a fork to cut the butter into the dry ingredients until it is broken into small chunks (the size of gravel or baby peas). When the crust is done pre-baking, remove it from the oven (do not turn off the oven) and pour the cranberry orange mixture into the pan. Smooth into an even layer, and then sprinkle the streusel evenly over the cranberry mixture. Bake for 30 minutes or until the streusel begins to turn slightly golden and the crust layer is cooked through. Cool completely before slicing. For cleanest slices, chill in the fridge or freezer before cutting, use a very sharp knife, and wipe the blade between slices. Thanks, June! I am right there with you on Team Cranberry! This is honestly the best ‘leftovers” recipe I have yet to see! Never would I think to use lefttover pie crust for shortbread bars! Genius yet so simple, love it! UH! YUM! First off, I really loved your penicillin reference in the first line of this post. That totally made my day. Ha! Seriously though, I love the use of leftovers especially when dessert is involved … and I love even more when cranberry sauce tastes like candy. 😉 Pinned! This is the kind of accident I want to happen to me 🙂 Just love the combination of cranberry orange!! Nora, these look like the BEST kind of accident! I saw these on IG and instantly started drooling 🙂 What a fun kitchen adventure! It really was! Don’t you love when that happens!? These are absolutely gorgeous Nora! I am in love with the orange + cranberry combo, and it’s so great that this was inspired by you mother-in-law’s legendary cranberry sauce! What an awesome flavor combo! Cranberry and orange sound amazing together!! 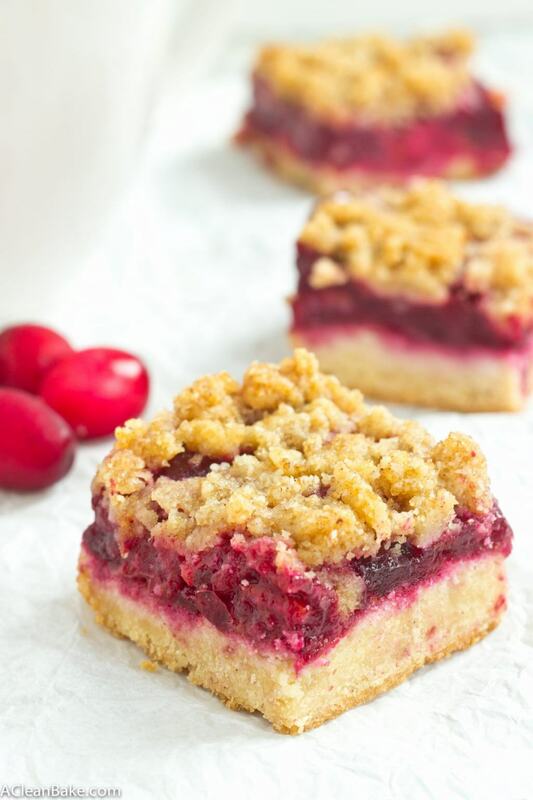 How delicious are these cranberry and orange bars! 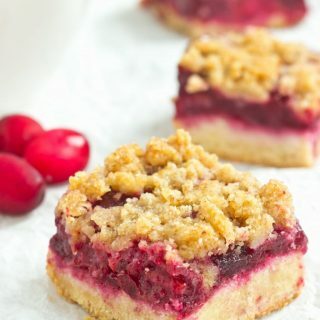 I love cranberry recipes for this time of year.. so I definitely will be making these bars for Christmas time! I hope you love them, Thalia! I can only hope they are good enough to do justice to the famous cranberry sauce that inspired them! Oh man, these look SO good! 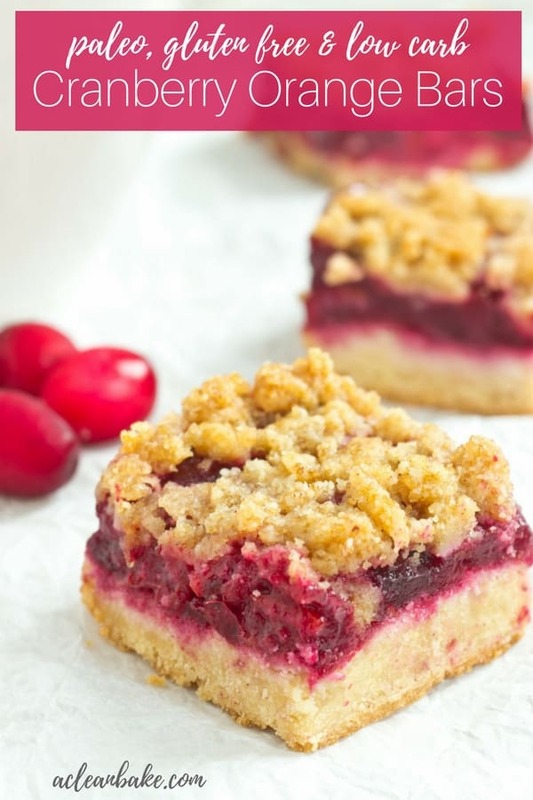 I love cranberries, especially paired with orange, and piled on pie crust with streusel too?! Yum! 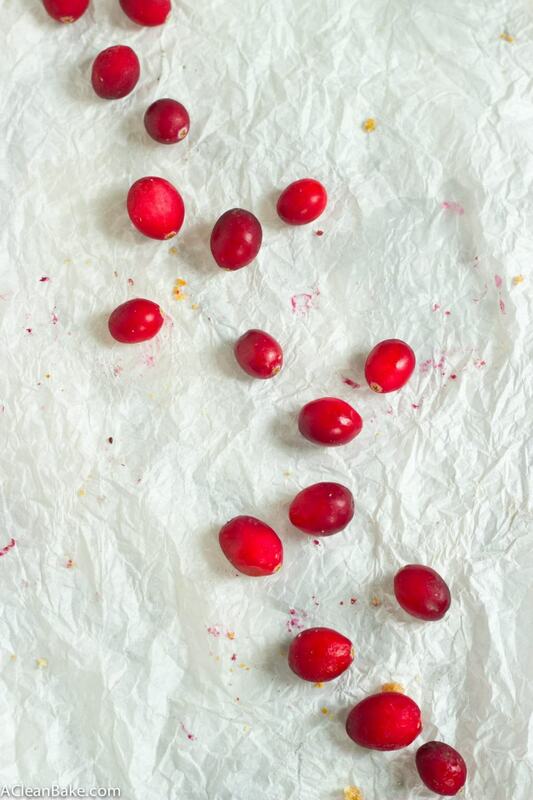 Yep, the flavors of the cranberries and orange in these are really clear – you’d love them! I didn’t have any cranberries, but i did have a bag of raspberries! I omitted the 1/4 c. water and ended up thickening it a bit with cornstarch (next time I’ll try tapioca starch) and it is quite delicious! I can’t wait to try it with actual cranberries now that they are showing up in the stores again! What a great idea! I’m thrilled to hear that you had success with raspberries. Sounds like a perfect summer variation. By the way, if you don’t have any kind of reaction to corn, feel free to use the cornstarch when you make these again if they worked well the first time! It’s certainly a lot easier to find in stores. I use tapioca starch because I tend to be a little bit sensitive to corn, but either way should work fine!